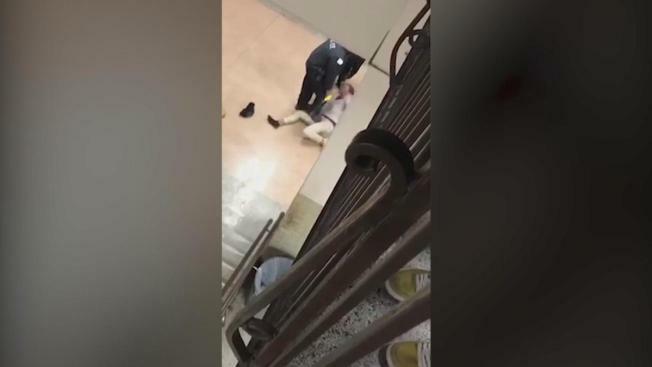 The 16-year-old student said she was tased three times by two Chicago police officers during the incident at Marshall High School. Newly obtained video appears to show what Dnigma Howard's father and attorney have claimed since the teen was involved in an altercation with police in January at Marshall High School, they say. Andrew Stroth is a civil rights attorney with the Action Injury Law Group and he says what the video shows is clear. "An unarmed 16-year-old girl being kicked, tazed, punched and dragged down stairs," Stroth said. Police said in January they fell down the stairs and Howard's 16-year-old daughter bit and punched the officers when she wouldn't give her phone to the assistant principal. Howard says the new video shows the police officer initiated contact with his daughter. New video sent into NBC 5 Investigates shows, in detail, a confrontation between a high school student and a CPD officer inside of a school. NBC 5 Investigates' Chris Coffey has the latest details. "She was merely walking away, like she said," he said. A judge later dropped felony charges against Howard's daughter Dnigma. "Without this tape my daughter would face criminal time," Howard said. He and his attorneys filed an amended civil rights complaint Thursday. "The amended version contradicts the police version," Stroth said. Dnigma Howard is at a new school, but carries old issues, she said. Dnigma Howard's attorneys say they want to send a message to police, schools, the mayor of Chicago, and the next mayor that more needs to be done when it comes to officers in public schools and how they handle people who may be in emotional distress. NBC 5's Charlie Wojciechowski has the story. "She don't trust nobody no more," her father said. "(She) sees officers and cringes. (It's) not right." Cpd says the incident is independently investigated by the Civilian Office of Police Accountability, so they can't comment, but they have not stripped the officers of their powers. Felony charges have been dropped against a 16-year-old after an altercation she had with Chicago police. NBC 5's Christian Farr has the latest details. But Howard said he would like to see that.